What is a telephone switch? Basically it is the device or system that connects one telephone line to another telephone line so that two or more people can carry on a conversation over their respective telephones or so that your computer's modem can connect to a remote modem such as a remote modem owned by an ISP (Internet Service Provider) which in turn connects you to the Internet. But it is more than that. Unlike a switch that allows a person to turn on and off a bedroom light, a telephone switch or switching system is rather complex in that it has to do more than just connect two wires together. It has to know when you pick your telephone's receiver (or handset) up to make a call and provide a "dial tone". It has to recognize special tones called DTMF (better known as Touch-Tone) or rotary dial pulses. It has to provide special "supervisory" tones to the calling party to let you know when the other phone is ringing or is busy, and Special Information Tones (or SIT for short). There are other "behind the scenes" operations of a telephone switch which is covered in the latter of the two documents that follow. This section of the web site presents some technical and historical insight into the evolution of the telephone switching systems over the past 100 plus years. Although most of the systems discussed in the documents that follow have long been replaced by modern switches, it is beneficial to understand how we got to where we are today. The first "telephone switch" or "dial telephone system" was developed by Almon Strowger. A nice chart that Steph Kerman scanned showing the "History and Development of Strowger Automatic Telephone System" is viewable by clicking HERE for the PDF version of the timeline chart or HERE for the GIF image version of the chart. "Mr. Strowger was an undertaker in Kansas City and in 1891, irritated beyond endurance because he thought he was being given wrong numbers by central office operators, he decided to take the matter in hand and do something about it. He had some good reasons for being disgruntled with his telephone service. As the telephone business grew faster and faster in Americas larger cities, telephone central offices grew more and more complex. The switchboards were something to behold, with many, many operators sitting in long rows plugging countless plugs into countless jacks. The cost of adding new subscribers had risen to the point foreseen in the earlier days, and that cost was continuing to rise, not in a direct, but in a geometric ratio. One large city general manager wrote that he could see the day coming soon when he would go broke merely by adding a few more subscribers. There was need for a break-through of some kind, and Mr. Strowger went a long way towards providing it. For he claimed to have invented the dial telephone system. It is also said that the Bell Company engineers and inventors had laid the groundwork for him. In 1879 an engineering firm called Connolly, Connolly and McTighe patented the first automatic telephone switch. It was the first of some 2500 such patents which would follow it, but it did not work successfully. Neither did the others, although there is evidence that a dial was used to set up connections on inter-office lines between Worcester and Gloucester, Massachusetts in late 1885. In 1884, Gilliland, now head of the Mechanical Department, devised a customer-operated switching technique called the village system. It was good for no more than 15 telephones, however, and was replaced when the town, or the telephone demand in the town, grew beyond the systems capacity. 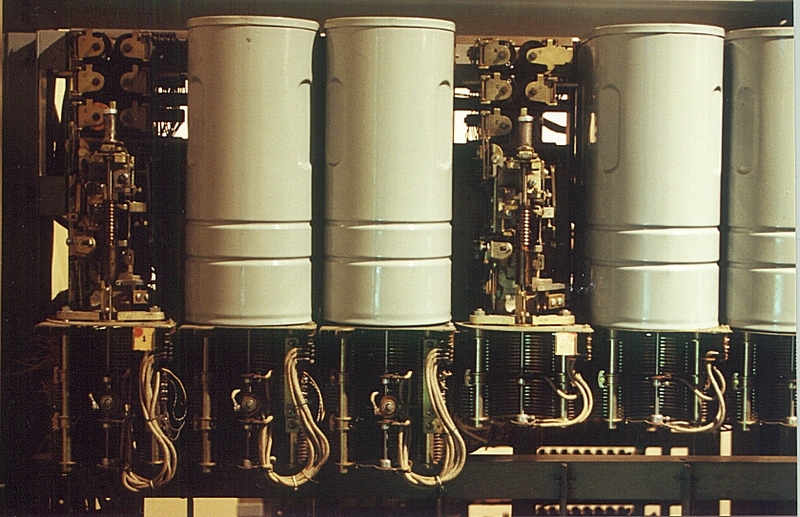 The village system, too, was considered to be automatic when it was in use, although by todays standards it would be considered only a complex wiring plan. But Strowgers system did work. It made use of many features already patented, but it worked. Strowger kept his costs down, too. The first working model was constructed inside a circular collar box. Strowger moved into telephony from the undertaking business because, as the near-legend has it, he was convinced that some local telephone operators, their power over him having cone to their heads, were deliberately giving wrong numbers and busy signal reports to his customers in order to drive him out of business. Without trying to find the truth behind the suspicion, it seems, Strowger determined to find a way to rid the world of those pesky operators, once and for all. He made a pretty good try. 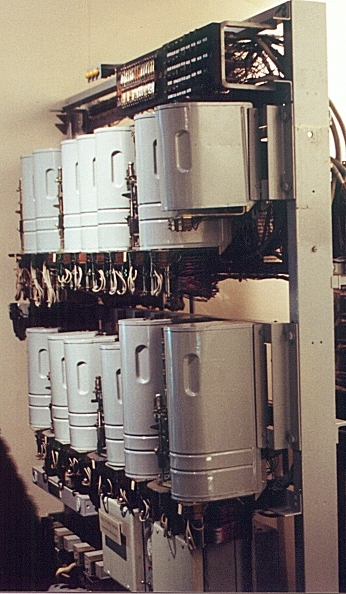 The first Strowger office could serve only 99 telephones, used buttons instead of a dial and each telephone needed a strong battery and five wires to connect it to the central office. During the next few years, however, these and other problems were solved. In 1896 the first system, this time using a dial, was built by the Automatic Electric Company of Chicago, based on Strowgers patents. It went into operation at the City Hall in Milwaukee, Wisconsin. "The story as it was told to me was Almon was an undertaker ... the only undertaker in his town. When someone died and the family wanted to call Almon to do his thing, they rang up the operator and she would plug them into Almons line. Being the only undertaker in town, Almon had all the business he could handle. Suddenly his business began to slack off. As he scanned the newsprint and read the obituaries, he realized HE wasnt taking care of all the bodies in town any longer. He began to investigate and learned that the new undertaker in town was "seeing" the town operator and she was giving him preferential treatment. Almon began to wonder how he could overcome this so he went down into his workshop and created a little box. He took his little box to the town switchboard and connected it up. He instructed the operator to plug into this little box each time someone asked for the undertaker. What it did was "switch" back and forth from undertaker to undertaker. A family called and she plugged into the little box and it connected them to the new undertaker. When the call was completed and she pulled OUT of the little box, a small arm would swing over to Almons side. When she pulled the cord out of it again, it would swing over to the new fellas side. Thus, the first "automatic" switch." "Strowgers first automatic switch was controlled by a series of pushbuttons, not by a dial. There was one pushbutton for each digit. Each pushbutton had to be pressed individually a number of times corresponding to the digit, i.e. 5 times for the digit 5. The first commercial Strowger automatic system (using pushbuttons) was placed in service in La Porte, Indiana in 1892. The dial, replacing pushbuttons, was first used in Augusta GA in 1896. It was a very large dial. In those days. Two wire lines plus a ground connection were required. The small dial was invented in 1907. (a two wire version , without the ground, of the large dial type system went into service in Pontiac IL in 1908) The first major installation using the small dial (two wires, no ground) was in Lansing, Michigan in 1908. All of these installations were for independent telephone companies since the Bell System did not install their first automatic exchange until 1919 in Norfolk, VA. Ma Bell takes credit for making the dial system "commercially acceptable." This is pure fabrication. That first Bell installation was supplied by Strowgers Automatic Electric Company. The one feature which was provided with the first Bell System exchange in Norfolk, VA was dial tone. Strowgers systems installed before that time in the US did not have dial tone. Subscribers just picked up the receiver and started dialing, without being able to know for sure that the equipment was ready to receive their calls. If the call didnt complete, they just hung up and started over. When Lucent was first created as the spin-off of AT&T Technologies from the parent AT&T, Lucent came out with a series of ads which reviewed many of the achievements of Bell Labs technology. 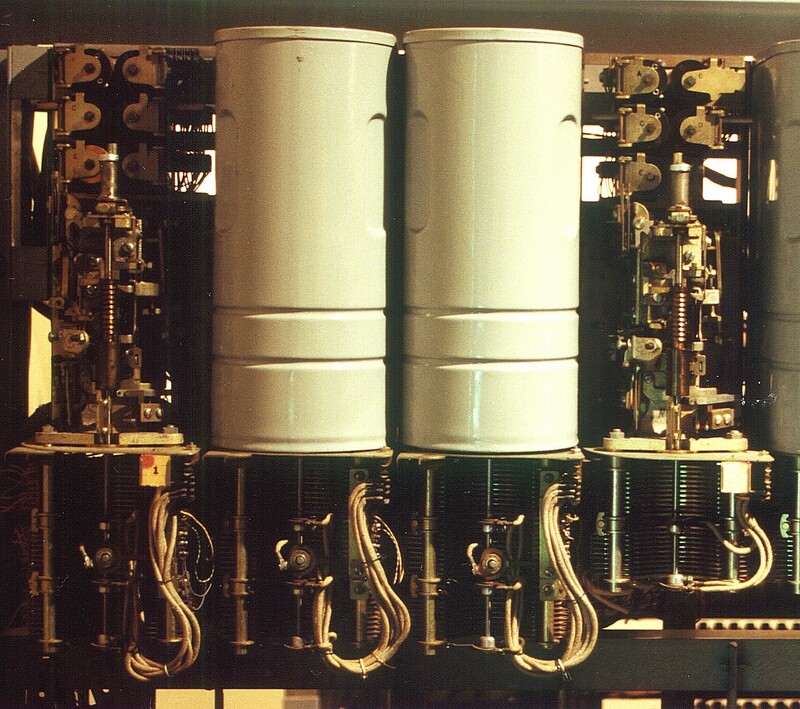 The transistor was one such notable result of Bell Labs research. One of the ads featured Bell Labs as the inventor of dial tone. Well, that wasn't exactly accurate. Bell Labs, working with the equipment supplier Automatic Electric, did arrange to have dial tone provided with the Norfolk equipment, making it the first time dial tone was used in the Unitied States. They however, didnt "invent" it. Dial tone was first used in Germany in 1913. The very first dial exchanges in Germany were supplied by Automatic Electric, but soon Siemens and others were making their own dial equipment. At first it was under license from Automatic Electric, but very soon there were distinctively German versions. (If you ever have an opportunity, be sure to visit the telephone section of the Deutsch Museum in Munich. It is really great) The Germans were the first to use dial tone and its benefits were recognized and incorporated into the equipment supplied for Norfolk. I have not been able to track dial tone in the US, but it is my impression that it didnt take long before it became a standard feature with all automatic switches for both the independents as well as the Bell System. Strowgers system was reluctantly accepted by the Bell System. It was an operators strike in Boston that finally woke up AT&T that the dial system was here to stay and that they had better recognize this fact if they were to stay in business. For many years Strowgers Automatic Electric Company supplied dial switching equipment to the Bell System and for many more years Western Electric made Strowger-type equipment under license from AE Co. It was a commercially acceptable system, used around the world, without any contribution from Ma Bell. During the early years of the depression, Automatic Electric was working 7 days a week manufacturing equipment for Bell under a contract signed just before the 1929 crash, while Western Electric was down to working 2 days a week. They begged and cried to get out of that contract, but AE Co held them to it. These are things you dont find in the official Bell System publications. Some of the above information is from a brief "History of Strowger Progress" in the opening pages of the book "Automatic Telephone Practice," by Harry E Hershey, copyrighted in 1954. He was a 43 year veteran of Automatic Electric, the last 12 years of which supervised their technical publications. He retired on January 31, 1954." This book was written and published in English by a French citizen by the name of Robert J. Chapuis and published by North Holland Publishing Company - Amsterdam and New York, in 1982. Chapius was at that time the head of the telephone operation and switching department of CCITT, in Geneva, Switzerland. CCITT (the letters stand for the French words which mean International Telegraph and Telephone Consultative Committee) which is part of the International Telecommunications Union. This book is an absolute gold mine of information, not only on US switching systems, but on systems around the world. The Preface to this book was written by A E Joel, Jr. who for many years was "Mr. Switching" at Bell Labs. This book is well written, easy reading and contains a fascinating amount of historical data, including some which I happened to be familiar with but which I doubted almost nobody else would know. 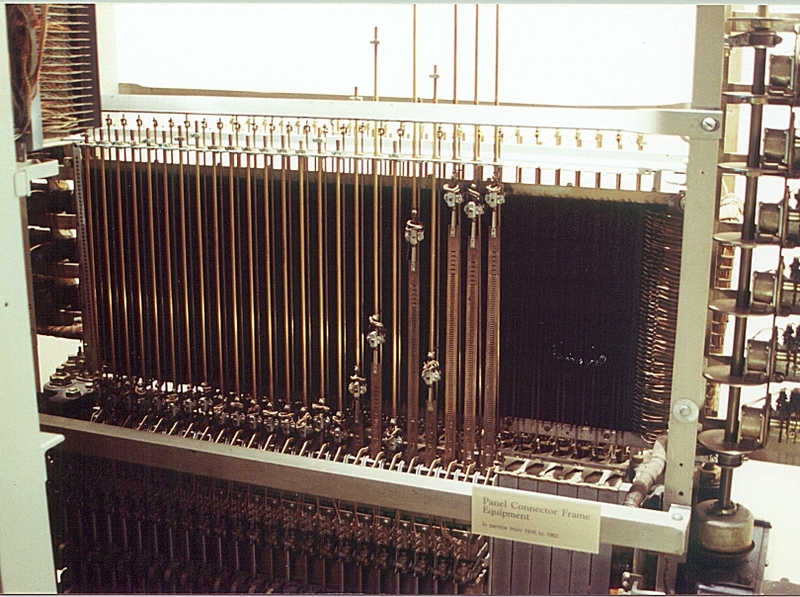 That was the history of a crossbar exchange made by Kellogg in 1954 for NTT and installed in Tagasaki, Japan. In this book you will find data on the Western Electrics panel and rotary systems, the latter of which was sold to ITT as part of the package when ITT purchased International Western Electrics foreign subsidiaries in Europe in 1925. The rotary system was used all over Europe, in Mexico, Puerto Rico, North Africa and South America. It outlasted Panel by many years. The last Rotary exchanges in the world are just now being retired from service in Rio de Janeiro, Brazil. I used to work in the telephone company in Lima, Peru which in the late 60s was a 100% rotary city. For a fascinating collection of Strowger history, sound recordings, etc. see The Strowger Telecomms page. Moving ahead in history, but not necessarily in chronological order, the following documents covers ESS, step-by-step (example photos 1 - 2 - 3 - 4), crossbar, and panel switching. A one-page description of the No. 2 ESS developed by Bell Labs is described in the July 1969 "Bell Laboratories Record" and you can view the article by clicking HERE. 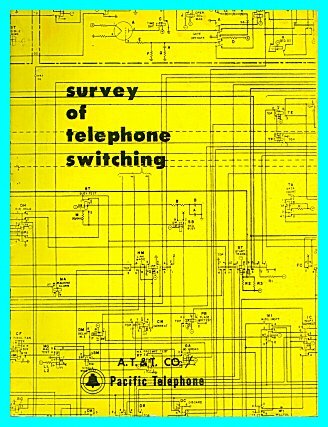 Presented below are two documents on telephone switching systems of the past; one is from the book "Telephone: The First Hundred Years" and the other is from a book (manual) called Survey of Telephone Switching loaned to me by Todd Bernstein. I would like to thank Todd for his contributions and making this publication available to the world of telephone collectors, historians, and hobbyist. 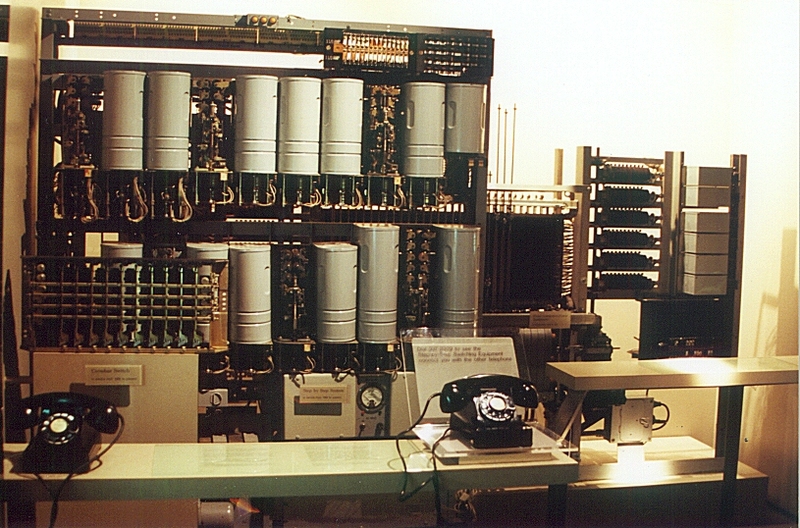 "Of all the new 1960s wonders of telephone technology - satellites, ultra modern Traffic Service Positions (TSPS) for operators, the picturephone, and so on - the one that gave Bell Labs the most trouble, and unexpectedly became the greatest development effort in Bell System's history, was the perfection of an electronic switching system, or ESS. It may be recalled that such a system was the specific end in view when the project that had culminated in the invention of the transistor had been launched back in the 1930s. After successful accomplishment of that planned miracle in 1947-48, further delays were brought about by financial stringency and the need for further development of the transistor itself. 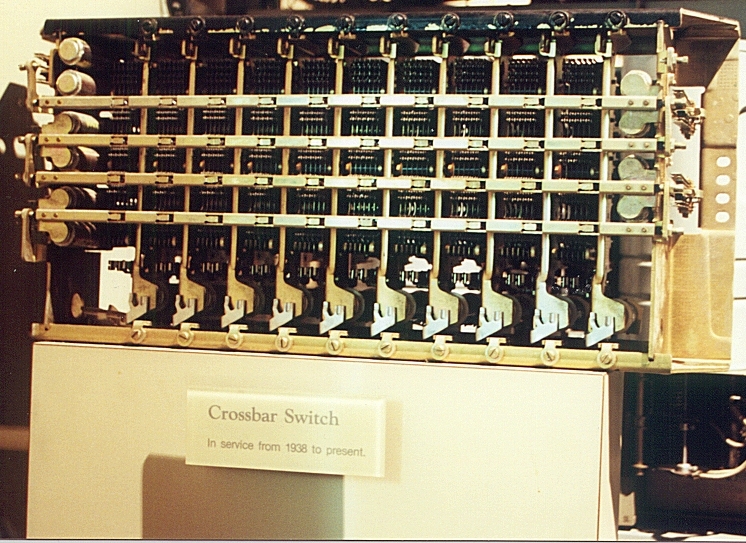 In the early 1950s, a Labs team began serious work on electronic switching. As early as 1955, Western Electric became involved when five engineers from the Hawthorne works were assigned to collaborate with the Labs on the project. The president of AT&T in 1956, wrote confidently, "At Bell Labs, development of the new electronic switching system is going full speed ahead. We are sure this will lead to many improvements in service and also to greater efficiency. The first service trial will start in Morris, Ill., in 1959." Shortly thereafter, Kappel said that the cost of the whole project would probably be $45 million. But it gradually became apparent that the development of a commercially usable electronic switching system -in effect, a computerized telephone exchange - presented vastly greater technical problems than had been anticipated, and that, accordingly, Bell Labs had vastly underestimated both the time and the investment needed to do the job. The year 1959 passed without the promised first trial at Morris, Illinois; it was finally made in November 1960, and quickly showed how much more work remained to be done. As time dragged on and costs mounted, there was a concern at AT&T and something approaching panic at Bell Labs. But the project had to go forward; by this time the investment was too great to be sacrificed, and in any case, forward projections of increased demand for telephone service indicated that within a few years a time would come when, without the quantum leap in speed and flexibility that electronic switching would provide, the national network would be unable to meet the demand. In November 1963, an all-electronic switching system went into use at the Brown Engineering Company at Cocoa Beach, Florida. But this was a small installation, essentially another test installation, serving only a single company. Kappel's tone on the subject in the 1964 annual report was, for him, an almost apologetic: "Electronic switching equipment must be manufactured in volume to unprecedented standards of reliability.... To turn out the equipment economically and with good speed, mass production methods must be developed; but, at the same time, there can be no loss of precision..." Another year and millions of dollars later, on May 30, 1965, the first commercial [electronic] central office was put into service at Succasunna, New Jersey. Even at Succasunna, only 200 of the town's 4,300 subscribers initially had the benefit of electronic switching's added speed and additional services, such as provision for three party conversations and automatic transfer of incoming calls. But after that, ESS was on its way. In January 1966, the second commercial installation, this one serving 2,900 telephones, went into service in Chase, Maryland. By the end of 1967 there were additional ESS offices in California, Connecticut, Minnesota, Georgia, New York, Florida, and Pennsylvania; by the end of 1970 there were 120 offices serving 1.8 million customers; and by 1974 there were 475 offices serving 5.6 million customers. The difference between conventional switching and electronic switching is the difference between "hardware" and "software"; in the former case, maintenance is done on the spot, with screw driver and pliers, while in the case of electronic switching, it can be done remotely, by computer, from a central point, making it possible to have only one or two technicians on duty at a time at each switching center. The development program, when the final figures were added up, was found to have required a staggering four thousand man-years of work at Bell Labs and to have cost not $45 million but $500 million!" PLEASE NOTE: Some of the image files and ZIP files found on the web pages of each chapter are very large (up to 1.5MB) and may take a long time to download. Also, the text on each of the web pages for each chapter do contain some errors. However, if you download the Word 97 files for each chapter, they have been closely proofread and should be close to error-free. Click on a hyper-linked chapter below to go to that chapter. 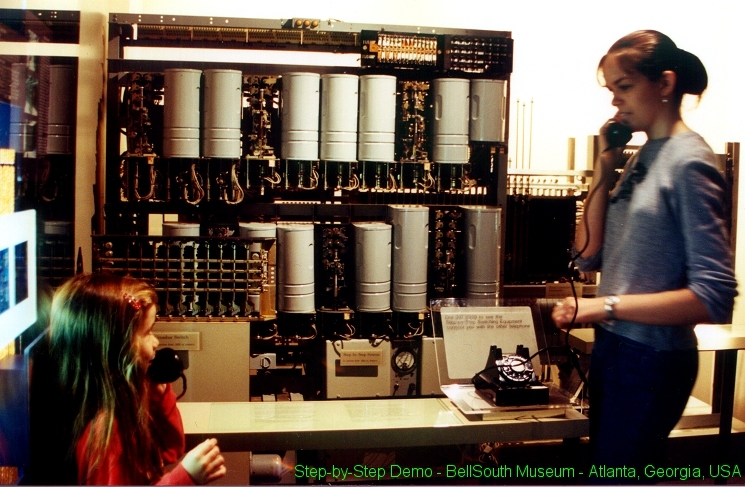 Two of my four daughters went with me to the BellSouth Telephone Museum in downtown Atlanta, Georgia, USA. In THIS photo you will see them test out the Step-by-Step switch demo. Unlike some "sheltered" kids today who have only used touch-tone phones, these two kids knew exactly how to dial those old Western Electric 302 (rotary dial) phones! can be seen at "Welcome to Kirt's Phone Page". "Here's a small sample of my recordings. I hope this brings back a few memories. You can credit it to Trace McCall. At the beginning of this recording, if you listen carefully, you can hear a 'snoring' sound in the background. That's the switchman running a linefinder test for me. It causes each finder to search 10 levels& banks sequentially. Elsewhere on the recordings we had about 4 of them running at once. It was very noisy! The intermittent chattering is a wirespring relay/crossbar matrix multifrequency sender. Of course you can easily pick out individual selectors, connectors, and linefinders." For even more good stuff, check out The Central Office web site.